Sheehan’s of Chatham Street is a traditional style family run Irish pub. One of Dublin’s little gems, Sheehan’s is one of Dublin’s oldest family run Traditional Irish Pubs. Run by the Sheehan Family for the past 80 years and located in the heart of the city, it is convenient to Grafton street shoppers and Gaiety theatre goers alike. We believe in serving the best in traditional Irish cuisine, including Irish Stew, Fish and Chips & our very popular Beef and Guinness Pie. We have a wide variety of local beers also available. 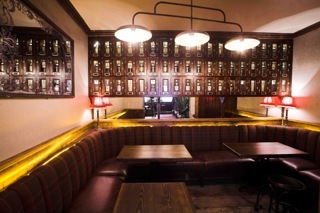 Our newly renovated Whiskey Cocktail Bar, located upstairs, serves a wide variety or Irish whiskeys and introduced the concept of having a personalised whiskey lockers to Dublin. Come in and soak up the atmosphere of a traditional Irish pub loved by visitors and locals alike. There’s a relaxed and genial atmosphere in this pub, no matter what time of the day or night you’re there! A fine place for a pint if you’re looking for a drink in relaxing surroundings of an afternoon. All major sporting events shown and function room also available. Planning a get together or special event? Call us to reserve an area. Finger food options available. Free Wi-Fi is available and all major credit cards are accepted. drinks at Sheehan’s of Chatham Street. © 2019 Sheehans Bar. All Rights Reserved.